What is a Menu Engineering Worksheet? One of the many tactics used to raise your restaurant's profitability is to audit and analyze the contribution margin of your restaurant menu items with a menu engineering worksheet. One of the many benefits of using a menu engineering worksheet is it will help you go through the procedure of measuring your menu performance, evaluate future and existing menu pricing as well as content decisions. Furthermore, this worksheet will guide you in determining which menu items are popular or lucrative and when it's time to replace items that are underperforming. Without utilizing a menu engineering worksheet, costs and cost mark-ups could end up inaccurate, which will prevent you from maximizing your revenues and profits. By completing a menu engineering worksheet, your profits could easily soar by 15 percent. This technique not only could raise your profitability, but also allows you to plan future marketing and management activities. 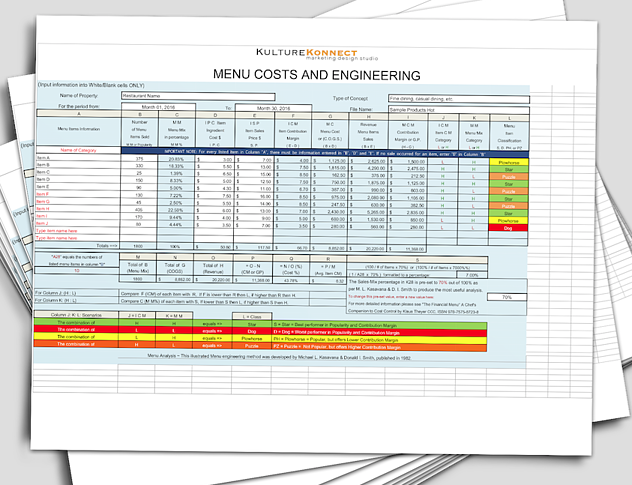 Kulture Konnect's FREE, Fill-in-the-Blank Menu Engineering Worksheet is easy-to-use and will aid you in understanding how to examine, structure and categorize your menu items accurately. Are you seeking professionals for your restaurant marketing, menu design or other services? Contact us here for more information. Visit our portfolio for a glimpse of our work here.